ISS-IMAP (Ionosphere, Mesosphere, upper Atmosphere, and Plasmasphere mapping) mission will reveal the following three processes to elucidate the physical mechanisms in the boundary region between the Earth system and the outer space. (1) energy transport process by the atmospheric structures whose horizontal scale is 50-500km in the upper atmosphere (2) process of the plasma transport up to 20,000km altitude (3) effect of the upper atmosphere on the space-borne engineering system. 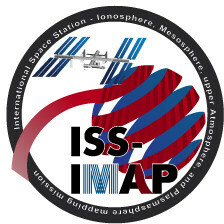 ISS-IMAP mission is a space-borne mission to elucidate the mesoscale structures in the ionosphere, the mesosphere, and the plasmasphere by imaging observations. It is installed in Multi-mission Consolidated Equipment (MCE) on the Exposed Facility of Japanese Experiment Module on the International Space Station (EF of ISS-JEM). The scientific instruments were delivered to ISS-JEM in July 2012. The observation was started in the summer of 2012. It will make imaging observation of the Earth’s upper atmosphere with visible-light and infrared spectrum imager (VISI) and extra ultraviolet imager (EUVI) for three years and more. The objective of this mission is to clarify the energy transport process by the structures whose horizontal scale is 50-500km in the Earth's upper atmosphere, and the effect of the structures and disturbances on the space-borne engineering system.